Here's a riff on an Old Fashioned cocktail that will please gin lovers and elderflower liqueur lovers alike. 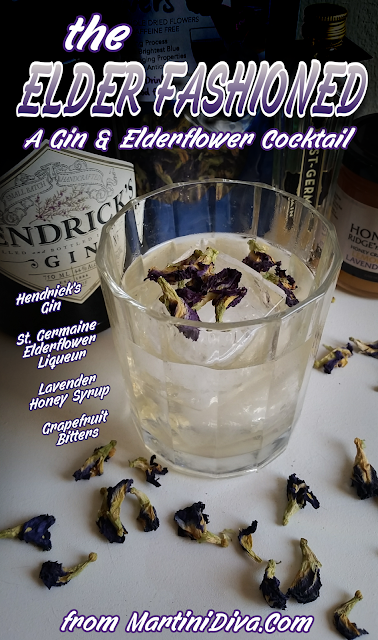 Using Hendrick's Gin with the elderflower liqueur made this a very floral forward cocktail. A little Lavender honey simple syrup blended nicely and a dash or two of grapefruit bitters added just the right amount of citrus to balance out the drink. Hendrick's is a true floral gin and loves bring paired with Elderflower which is one of its botanicals. I just kept going merrily on down that flower path with the lavender honey and a garnish of dried butterfly pea flowers. DIRECTIONS * Prepare the Lavender Honey Syrup by mixing 1 teaspoon of hot water with 1 teaspoon of Honey Ridge Farms Honey Créme Lavender. Chill the glass in the freezer. Add the ingredients to an ice filled cocktail shaker and shake until well chilled and blended. 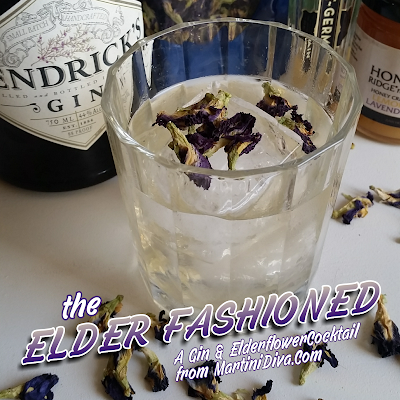 Strain into the chilled glass, garnish with a few dried butterfly pea flowers and serve.